They came from Syria, France, Argentina, Belgium, and India to Mesopotamia. Some of them have been living in Iraq more than forty years to witness to the love of Christ in the land of martyrs. They love Baghdad and its people and decided to continue living and serving this country despite the enormous challenges, hardships and lack of security. Working in Baghdad silently and with great humility, those missionaries care only to announce the word of God to those who are hungry for it. 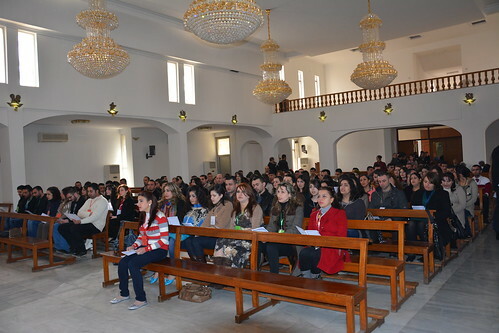 They did not hesitate last Friday 13th December 2013 to share young people of all the Catholic Churches of Baghdad the fruits of their experience in a gathering held in the Cathedral of St. Joseph of the Latin church and organized by the Committee of the Catholic Youth of Baghdad. Each of them answered the questions: “Why did you come to Iraq and why do you want stay? Fr. Fareed Peter from Syria explained the stages that prepared him to come to Iraq and serve the Chaldean Church. His main concern is helping in elevating the lives of the faithful and to promote solidarity with the Iraqi people, particularly in Baghdad where missionary work is rather weak. This desire of his was inspired by serving the displaced Iraqis in Damascus in 2008,and by living with them deep experience that turned to be a book. Fr. Fareed ended up by affirming to the youth that his basic message for all of them is to be a missionary. Sister Martin of the Little Sisters of Jesus came from France to Iraq in 1976 where she faced two trials. The first is the challenge of the loss of identity at the expense of the discovery of the new values of the country she came to serve. The second is to be shut out to one’s traditions and customs in fear of the loss of identity without learning something new. She said that she was usually asked: “Why have you stayed in Iraq?” She often said nothing but to live in love and solidarity with the Iraqi people for who she gave a large part of her life. Father Luis from Argentina arrived to Baghdad a month after the massacre of the church of Our Lady of Deliverance in 2010, cited the words of Pope Francis: “There is not a full life without giving one’s life for others.”and that all of us are missionaries in our surroundings. He said that young people today are unhappy because they do not give their lives for others. Once they experience the joy of giving, they will be able to live this a full life. He emphasized that although some saw his residence in Iraq seems crazy, it stems from his belief in the Middle East as the home country of Jesus Christ and the land of the first Christian martyrs. It also stems from the belief in self-giving to the most needy. Father Van Fussell (Mansour) a Redemptorist monk from Belgium, which still serves the Church in Iraq for more than forty years. He said that a human being is a result of others. 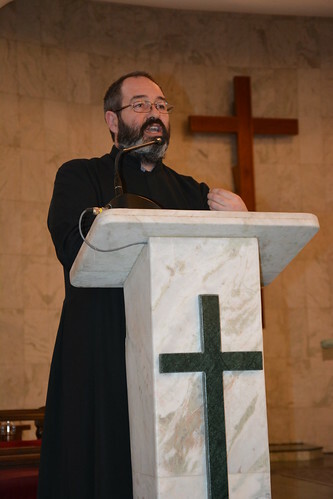 Fr.Mansour along with father kop Almakhlsa, “Bible incarnate” as he described him, and Father Francis Almakhlsa all lived with the Chaldean monks in Al-Dora, one district in Baghdad where there was no water or electricity, and then with the American Jesuits, serving people and educating the youth about their faith. Finally was sister Zoe from India, belonging to the missionaries of charity of Mother Teresa, coming fir the poor, with her her other sisters who came from Ethiopia, Kenya and India. She began her speech with words of Jesus: “All you do to one of my brothers, you do to me.” Their main mission in Baghdad that started since 1991 is to serve the poorest of the poor, the neglected and outcasts from their families. In their convent they currently have 22 children whom they serve with much devotion and love. 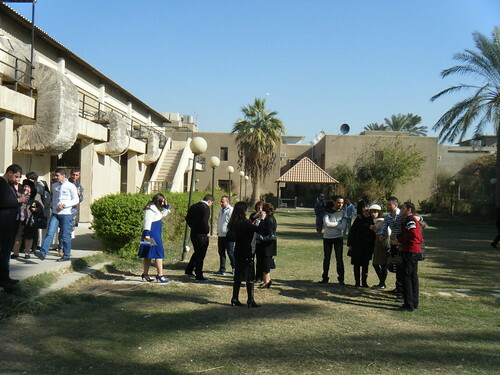 To this meeting of the Catholic youth came more than 250 young men and women from all parts of Baghdad. After listening to the experience of these five fathers and sisters, the youth were divided into discussion groups in which they expressed their impressions, ideas and the meaning they find behind the presence of such missionaries in their country. Some said that the presence of those missionaries stands as a challenge for them. In a time when many young Christians plan to flee their country and their churches in search of security and a better life financially and socially speaking, foreign sisters and priests come to serve them no matter how dangerous that will be for them. Other youth expressed their fear that though they sincerely appreciate the influential work these missionaries are doing, it is too hard for them them to follow their example in the midst of the difficulties they live in. Others emphasized that they are learning a lot from the missionaries’ spirit of service and self sacrifice, considering them a source of inspiration and support to the faithful. Interestingly enough, some youth affirmed that those missionaries came here to learn more about middle eastern lands like Iraq, the land of saints and martyrs, to learn from the church of these countries which had been always strong in the face if persecution and hardships. 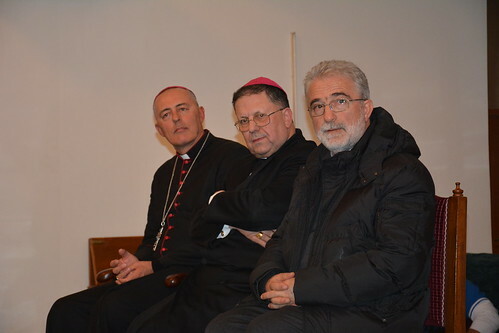 The youth meeting was also attended by Archbishop Jean Sleiman, Latin bishop in Iraq, and The apostolic Nuncio, the Pontifical Giorgio Lingua, accompanied by the Italian team that came to visit Iraq these days and which was the main benefactor of supporting and funding the youth center for sports, named after John Paul II. The meeting ended with singing a praise to God and the prayer of ‘Our Father’ with a heartfelt hopes for a better, blessed, and peaceful days in Iraq and the whole world.